Feel right at home when you relax in this leather stationary sofa from our Home Traditions line. The smooth, semi-attached square back is banded and corded with the added comfort of a baffled bag in the back. The smooth, rolled arms flow into the stepped-in back where they converge with the contoured and padded lower arms. The front of the arms are covered with face caps that are accented with brass tacks for a distinguished look. This stunning assembly rests on distinctive bun legs which are finished in a choice of Distressed Pecan or Antique Black wood finish. The Noble Stationary Leather Sofa With Nailhead Trim by Best Home Furnishings at Best Home Furnishings in the St. Louis, Chesterfield, St. Charles, MO & Waterloo, Belleville, Edwardsville, IL area. Product availability may vary. Contact us for the most current availability on this product. Fabric Options Only available in leather match. Limited color choices available. The Noble collection is a distinguished, traditional look with plenty of comfort to spare. Covered in premium leather, these pieces have the look and durable cover that can furnish your home for years to come. Carefully designed padding and springs guarantee the durability of Noble upholstery. 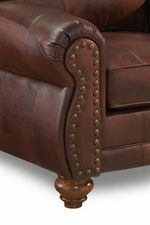 Adding an ornate and classic feel to this style are rolled panel arms with copper nailhead studs and classic, turned wood feet. Choose the Noble collection for ideal, traditional living room decor. The Noble collection is a great option if you are looking for Traditional furniture in the St. Louis, Chesterfield, St. Charles, MO & Waterloo, Belleville, Edwardsville, IL area. Browse other items in the Noble collection from Best Home Furnishings in the St. Louis, Chesterfield, St. Charles, MO & Waterloo, Belleville, Edwardsville, IL area.